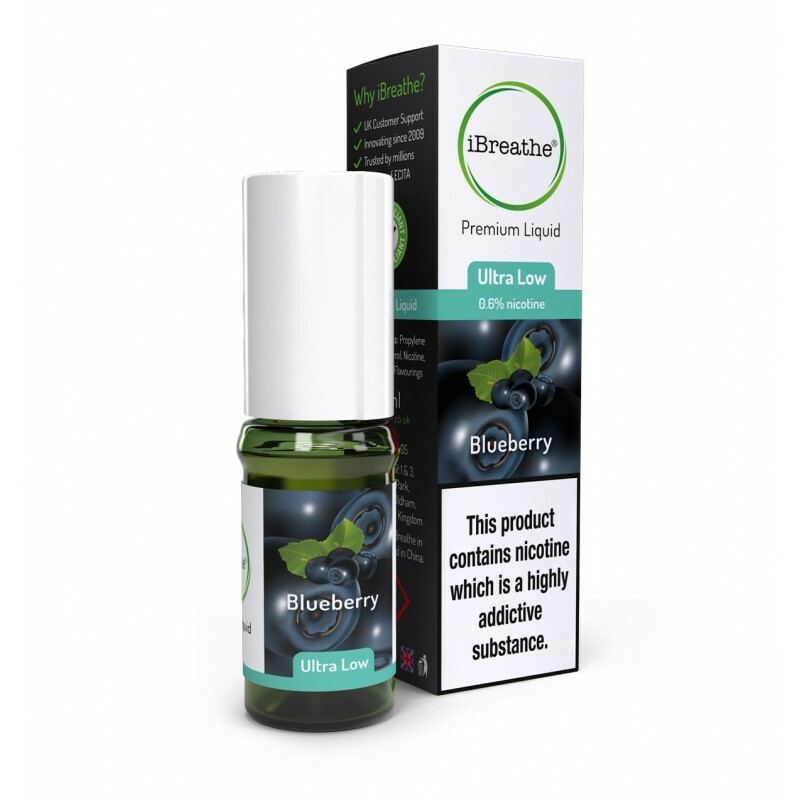 Like a blueberry muffin, without the calories or the cake, the iBreathe Blueberry Premium Liquid is a bold and fruity e-liquid with sweet juicy flavours and a rich blueberry aroma. Refreshing and tangy on the tongue, our Blueberry Premium E-Liquid is perfect for fruit lovers who will appreciate the burst of flavour with every vape. iBreathe specialise in crafting premium e-liquid refills with the highest graded and quality ingredients. iBreathe premium e-liquid Refills are produced using aseptic technique by professionals using only ingredients deemed safe for human consumption. All our iBreathe products are certified and compliant to TPD, CHIP, RoHS , MSDS, CE , CPT (Child Proof Safety). Our secret formula e-liquid Ingredients are tested and screened for purity by UKAS laboratories using GC/MS testing methods. To verify with MHRA that this iBreathe product is TPD compliant, use the following ECID codes. Free worldwide shipping when you spend £30 or more. Use Coupon Code INTDEL30 at checkout. 10ml High PG E-Liquid - Spearmint The brand new iBreathe Spearmint Premium E-Liquid is a light an..
10ml High PG E-Liquid - Strawberry A timeless classic, the iBreathe Strawberry Premium E-Liquid r..
10ml High PG E-Liquid - Exotic Mango Fruit flavoured Premium e-liquids are nothing new, but our E..
10ml High PG E-Liquid - Raspberry Fragrant and full of rich fruity flavours, the iBreathe Raspber..
10ml High PG E-Liquid - Berry Blast Berry Blast Premium e-liquid is an exciting mix of berry and ..
10ml High PG E-Liquid - Black Ice A winning combination of blackcurrants and mint, the iBreathe B..
iBreathe 9.6 out of 10 based on 1061 ratings. 1638 user reviews. © 2018 iBreathe Ltd. Company Reg: 08237178.